The part of the River Clyde where banks started to collapse after water levels dropped has started to fill with water again. 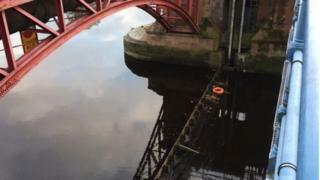 Glasgow City Council confirm the weir gate, which had jammed, had been lowered back into place. A spokesman said: "While this does not mean the weir is fixed, it should prevent any further damage to the river banks - which has been our priority." Some areas and pathways remain closed while the extent of damage is assessed. Structural damage and cracks could be seen on Waterside Street and Adelphi Street on the southern bank of the river. The public was asked to avoid these areas. The tidal weir was originally built to give a regulated height of water for use in cooling systems in the many industries in the east end of Glasgow. Without the weir, the upper channel would rise and fall with the tide from a depth of more than four metres to a depth of about 1.5 metres.